Drawtex Hydroconductive Wound Dressing from HealthyKin.com is a non-adherent dressing with LevaFiber technology. LevaFiber technology is a combination of two types of absorbent, cross-action structure that creates the ability to move large volumes of fluid and other debris from the wound through the dressing. 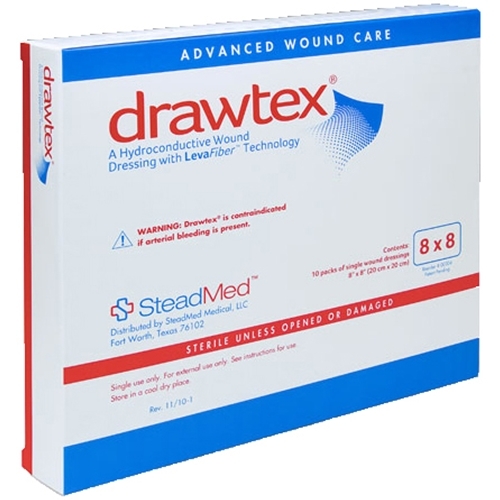 This hydroconductive action allows Drawtex to lift, hold and transfer the wound exudate both horizontally and vertically into the dressing, where it can absorb 500% of its own weight. The hydroconductive action disperses the contents of the dressing in such a way that another layer of Drawtex can be used for more heavily exuding wounds. Even when completely saturated, Drawtex maintains its integrity, stays in place and remains intact so it can be easily removed in one piece. No dressing particles are left in the wound. In addition to keeping the wound environment moist, drawing the exudate away from the wound surface removes toxic components, such as slough, necrotic tissue and bacteria, that compromise wound healing. This reduces the risk of infection and maceration of the wound. By dispersing the exudate both horizontally and vertically, Drawtex controls and retains the wound fluid within its cross-action structure. The wound fluid is held in the dressing so it can be transferred to another layer of dressing if needed. Drawtex provides hydroconductive debridement that lifts and loosens adherent slough. Even slough that is not taken up into the dressing migrates toward the dressing so that it can be easily removed when the dressing is changed. This is especially important for patients who have pain with sharp debridement. Drawtex with LevaFiber technology comes in flat sheets or rolls that can be cut to fit wounds of different shapes and sizes. Because it is so versatile, it can easily be used either as a flat dressing, a multi-layer dressing or as a drain for deeper wounds. Works the best of products that I have tried. Is very effective in the healing of my ulcer. Amazing product, price & expedient delivery. Works as advertised and does a good job. Works amazingly well for draining wounds, is easy and painless to remove and promotes faster healing. Recommended by Wound Care Clinic. Amazing results on venous stasis ulcer using this product. HealthyKin has very good price on this and fast shipping? Product, service & price...all 5 stars!